ARTIFACT: This is a late 1930s safe driver pin for Borden�s Milk by Whitehead & Hoag. Borden began producing dairy items in Connecticut as early as 1857. 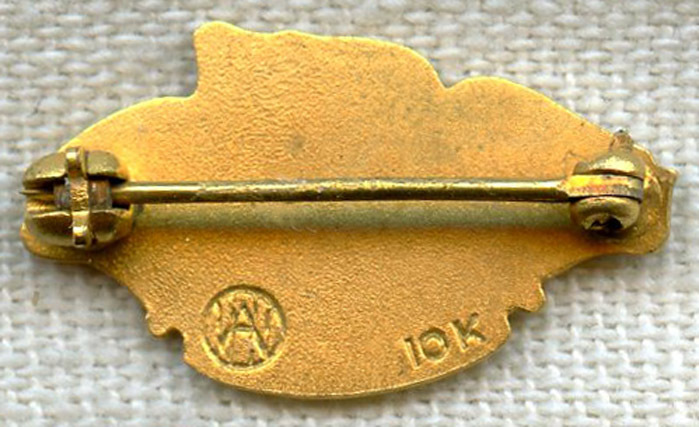 The pin is in 10 karat gold and shows a banner bearing three enameled stars beneath an eagle. SIZE: Approximately 7/16� in height and 13/16� in width. CONSTRUCTION/MATERIALS: 10 karat gold, enamel. MARKINGS: 10K and Whitehead & Hoag maker mark. CONDITION: 8 (Excellent-): The pin shows hardly any wear.